NLB Book Sale 2009, Grab 'em fast! Like yg, I was also given an assignment by Chun See. In his blog on Commonwealth Drive, he asked where exactly the PUB Gas Tank used to be located in Queenstown. I remember seeing it in the background of a railway photo taken at Tanglin Halt but because I'm unfamiliar with the place, I could not pinpoint its exact location. Luckily Philip Chew came to the rescue. Following his lead, I explored Tanglin Halt on Saturday and here is my 'result sheet'. Photo taken from corner staircase of Block 78 'Chap Lau' (10 storey). I was like leaning out of the corridor for the shot. If you've been to these old blocks, you know their corridor parapet wall can be pretty low, there's no handrail to grab if you lean over and oh boy please don't look down! You're hearing this from someone tall and who has acrophobia. Here is another photo I found from the archives showing the same gas tank. Photo taken below Block 78. On the left is Block 79 (with the railway running behind). Like Peter, Philip has a great memory. Or else how could he remember the place after 20 years? "I was quite familiar with the area at one time. I have not revisited the place for more than 20 years. The gas tank was beside Blk 79 nearby the railway line." Thanks for the lead, Philip! "I used to have fears as a kid about passing this place - maybe in the early 1960s. There was a stench in the air from the coking gas released to prevent built-up of pressure. I had this phobia that the gas tank might explode." I hope I'm wrong but why was the gas tank situated in a densely populated area knowing that it could explode? Even Chernobyl was not situated in a city. 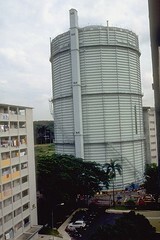 "There used to be another of this big blue gaswork tank just opposite my old house at Blk 77 Commonwealth Drive. After the block 80 or was it blk 79, where the malaysia railway is still operating now. I could see it from my kitchen. I lived there in the early 90s and we always joked about what happen if that thing were to explode…. :p"
I think I can answer her question. If that thing were to explode, the scene would look like my second shot. As always, you have done an outstanding assignment. Deserve an A* man. 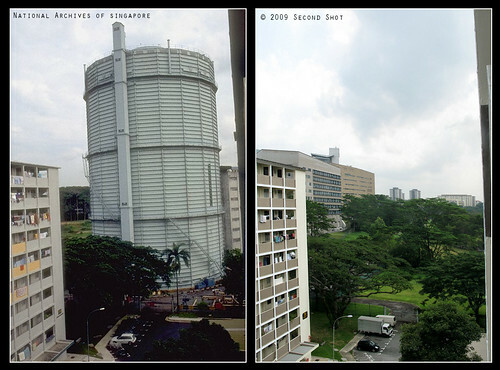 I notice that the tree bet Blk 79 and the tank is still there, practically unchanged. Thanks. Now that I know where exactly the tank used to be, I will explore the area a bit the next time I am there. I remember there used to be many old factories here. I remember visiting one garment factory when I was working in NPB in the late 80's. Amazing 2nd shots, Icemoon. Even the cars and the motorcycle parked at the roadside look the same in both photos. How did you do it, huh? Just like how you are doing it, Victor. Of course some image manipulation helps too. Sometimes I wonder if you ppl are learning from David Copperfield on those 'disappearing act'...well done. Very well presented past and present. One day it's there, the next it's gone. Good efforts. alamak! got grade for assignment, one. a*, woh! i have decided to withhold my posting on 'bahruddin vocational institute' for fear of getting a failing grade ('e'). anyway, i have always admired your 2nd shot works. Thanks for the encouragement, oldies. Reading your blogs got me into the mood. I will strive for higher precision next time. I'll be scared stiff too if there was a gas tank so near to where I stay. Thanks for the encouragement, STST. Adelin, yea it is like a ticking time bomb. Those blocks may not be around for long. The few blocks will be returned to HDB after the existing residents are relocated over to the new flats that are scheduled to be built on the empty piece of land opposite. That parcel of land used to house a cluster of flats that included block 50 and 51. Its residents have since moved over to the new si jiap lau. Don't think anyone (other than HDB) has any idea what is going to happen to those flats. HDB may convert them to rental flats or demolish them. Here today, gone tomorrow. You may want to remember the exact spot that you shot from and do a 3rd shot of the place should the flats go. Anon, thanks for the info and suggestion. Kinda sad if I have to do that 3rd shot. Indeed it will be rather sad to see them go. I was having coffee at the corner coffeeshop the other day and was thinking about what it must have been like for families and newly weds moving into those flats when they were brand new. Though expectations on built quality and unit orientation may have changed over the years, that great feeling you get when you first open the doors to your new home couldn't have differed too much, if at all. Hope you dont need to do that 3rd shot. 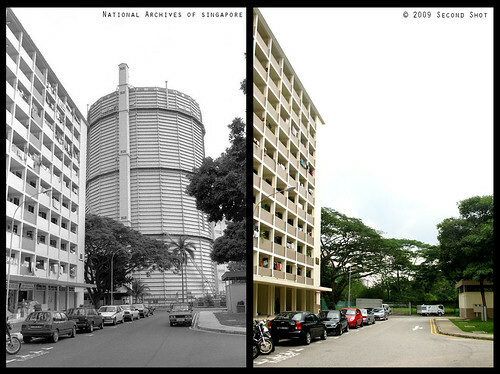 I used to see it as part of the skyline rising from among the Tanglin Halt flats, but never knew exactly where it stood. On National Day, a huge flag would be hung on it (I may be remembering wrongly here). I was not aware when it was torn down. When the Kallang gas tank was torn down, I remembered it was quite an emotional affair, and they were auctioning off some of the items in it. However I did not read similar report for Tanglin Halt gas tank. Maybe I just missed the report, if any. It's part of the landscape from our nostalgic past. It's interesting to find out now the exact location. I will definitely take a detour to block 79 the next time I cruise through Tanglin Halt. Great entries, it brings back memories! I just did an article on Kallang Gas Works. Can I request for the photo of the Tanglin Halt Gas Works ? Thanks. Good writeup on the Kallang Gas Works, Krisgage! I've not explored the place yet. Another great 2nd shot as always Icemoon. It's amazing and rather unusual to have a 2nd shot looking much like the old one except for the Tank. This is one of those place that hasn't really changed much. It is sad that the flats will soon be gone.